What do framers, cabinetmakers, do-it-yourself homeowners & woodworkers, trim carpenters, installers, and any number of other professional contractors have in common? They can all benefit from the outstanding accuracy, capacity, durability, and portability of the DEWALT DWS780 12-Inch Double Bevel Sliding Compound Miter Saw! 1.2 DWS780 Accuracy – Superb! 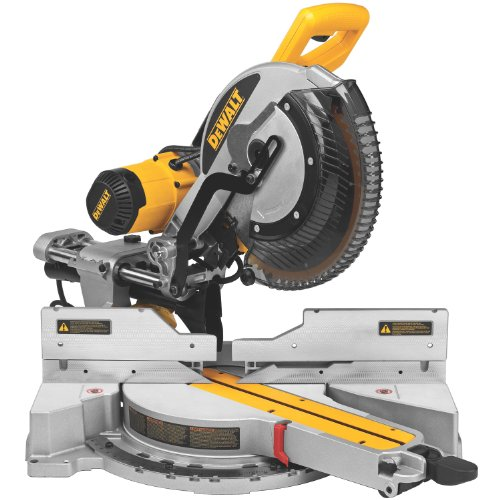 Ready to go right out of the box, sporting the high quality that long-time DEWALT owners have come to expect, the DWS780 is well balanced and smooth, with a powerful 15-AMP, 3,800 RPM motor powering 12″ saw blades designed for either a 1″ or 5/8″ arbor. To eliminate interference with the slide, the power cord is routed to the back through one of the rails. This unique XPS crosscut positioning system is as simple and logical as it is effective! It leaves laser systems in the uh… dust? Two ultra-bright LED lights in the upper blade guard shine down across the blade and cast a crisply defined shadow line on the work surface as the blade is brought close to the material, showing the operator exactly where the cut is going to be made (even in daylight) and how much material will be removed (kerf). Additionally, you don’t have to use the XPS when you operate the saw, and can turn it off with a switch located on the main handle. Watch all thirty six seconds of the “Accuracy” video below to see this system in action! Blades can be changed with no realignment of the XPS System required. The LED lights can not be knocked out of alignment through rough usage of the saw. Flooding the work surface with light provides better general visibility. Since dust buildup can eventually block the worklight, affecting its shadow line accuracy, regular maintenance consists of using a cotton swab (NO solvents – they can damage the lens!) to remove sawdust and debris from the LED lenses. 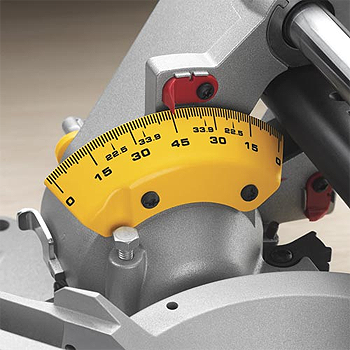 Designed with the precision accuracy needed for fine woodworking, the saw’s dual bevel system offers easy angle adjustment, and an oversize, high visibility bevel scale that runs from 0 degrees to 49 degrees, with stops at 0, 22.5, 33.9, 45, and 49 degrees both left and right. The miter scale consists of a tough, adjustable stainless steel miter detent plate with 10 positive stops at commonly used angles. The miter detent override allows fine angle adjustment right next to a detent stop without the hassle of fighting to stay out of the stop. Then you can use the cam lock miter handle to lock down the angle, making the process fast and accurate. Contributing to the saw’s accuracy is the machined base fence support, along with the dual horizontal steel rails employing an innovative DEWALT clamping system, and linear ball bearings for smooth slide operation. Miter saws spew a LOT of dust, and especially in the case of a slider where the dust source changes location, dust collection (short of custom made systems for in-shop use) are by most accounts woefully inadequate. However, DEWALT’s super efficient dust collection system on the DWS780 has been shown to collect an estimated 75% of the dust generated during operation, and even more when attached to a shop vac. User reviews online differ in their estimation of claimed “dust busting” effectiveness, but it’s likely that individual expectations vary as well. How (you say) did DEWALT arrive at the 75% dust collection figure?To conduct their tests, DEWALT weighed the wood samples before and after cutting, determining that the difference had become saw dust. Dust collection bags were weighed before and after the cuts, and the dust that accumulated in the bag was considered “collected.” DEWALT found that the ratio of dust collected to dust created averaged 75% or higher. This is definitely a big saw, with industry leading capacities, but still retains decent portability with its lighter-than-the-competition weight of 56 Lbs., the capability to be folded down, making it less bulky for transport and storage, and the three well placed handles for a firm, comfortable, balanced grip – two on the base and one on top. DEWALT’s design team must have put in some late nights to achieve the tremendous capacitiesof the DWS780 Double Bevel Sliding Compound Miter Saw. They were able to increase the vertical capacity with an innovative gearbox / belt-drive design, along with a rail lock latch that holds the saw’s head out away from the fences at a distance where the maximum vertical cut is delivered using the space behind the gearbox. That way contact with the work piece (and the risk of marking it) is minimized while delivering the tallest cut possible, which is especially useful when cutting tall base molding. Using the Tall Sliding Fence, the saw can cut nested crown molding up to 7-1/2 inches, and base molding up to 6-1/2 inches. Using the exclusive DEWALT Back Fence feature allows the DWS780 to cut 2-inch by 16-inch dimensional lumber at 90 degrees and 2-inch by 12-inch lumber at 45 degrees laying flat. Add in the flexibility of a dual bevel system that covers from 0 to 49 degrees both left and right, and a miter range that runs to 60 degrees on the right and 50 degrees on the left, and you can tackle pretty much any job requiring a crosscut. So what’s the word on the DEWALT DWS780? Using the DWS780′s adjustable, all metal depth stop allows you to use the miter saw like a radial arm saw to cut grooves and tall vertical cuts. The depth stop, which limits the depth of cut, is engaged by rotating a lever forward, and then using a depth adjustment screw to set the desired depth of the cut. Rotating the depth stop lever to the rear of the saw bypasses the feature. It is located on the right side of the saw arm near the pivot point. The DWS780 comes with an electric brake, which DEWALT says will stop the blade within five seconds of trigger release, giving the user both enhanced safety and productivity. Accessories (sold separately) for the saw include the DWX723 Heavy Duty Miter Saw Stand for a solid but easily transportable (35 lbs.) base, DW7080 Work Support Extensionfor long pieces, DW7051 Adjustable Length Stop for repetitive cuts (requires the use of the DW7080), DW7082 Clamp (similar to the one included), and the DW7084 Crown Molding Stops. 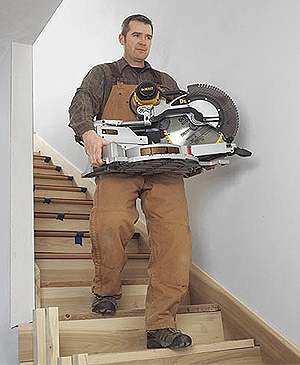 NOTE: Various descriptions of these accessories do NOT list the DWS780 among the saws they will fit, however, all of the accessories above are listed on page 2 of the DWS780 owner’s manual as being appropriate for the saw. I found few complaints (other than one individual who seemed to be having an alternate reality experience), but some users questioned DEWALT’s 75% dust collection claim, and thought that feature could be improved. However, the same users also stated that hooking up a shop vac did greatly improve efficiency. The smoke colored blade guard drew a minor complaint from a reviewer regarding alignment visibility, saying it could be improved by using clear plastic. There was also an observation that the DWS780 might be too muchmachine for the average backyard do-it-yourselfer. Can you hear Tim “The Tool Man” Taylor’s manly grunt of “More Power!” off in the distance?